Please see map here for the locations of these designated bathing waters. The bathing waters at Portnashangan and The Cut are classified as “Excellent” by the EPA assessment methodology based on the previous 4 years monitoring results. Lilliput showed much improved water quality in 2018 and is now classified as “Good” based on 2016 and 2017 data. In accordance with the Bathing Water Quality Regulations 2008, Westmeath County Council wishes to encourage public participation in relation to the establishment, review and updating of lists of bathing waters in Westmeath. To help with this process, Westmeath County Council is asking people who swim at lakes and rivers in Westmeath to tell them if they think these areas should maintain their existing bathing water designations or if areas that are commonly used for swimming, but not identified at the moment, should be given a new official bathing area designation. Submissions can be made by email to westmeathbathingwaters@westmeathcoco.ie or alternatively by hardcopy addressed to Senior Engineer, Water Services & Environment, Westmeath County Council, Áras an Chontae, Mount St, Mullingar, Co Westmeath, N91 FH4N. Latest date for receipt of submissions is 22nd June 2018. Preservation and improvement of our surface waters and groundwater is vital. The majority of the rivers in county Westmeath are failing to meet the standards set under the Water Framework Directive . Report an activity that may cause pollution. Maintain your septic tank or effluent treatment system in good condition. Ensure that foul and surface water connections are correct. Sinks, showers, toilets, washing machines & dishwashers should drain to the foul system) Roofs, paths, driveways should drain to the surface water system. 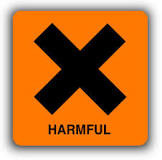 Do not dispose of fats, oils and grease "down the drain"
Do not use an in-sink waste disposal unit. This type of waste should be composted if possible. Enjoy the amenity of our rivers and lakes. A new section called Householder Information on septic tanks has been created by the EPA to help householders easily find the information they are looking for on septic tanks. 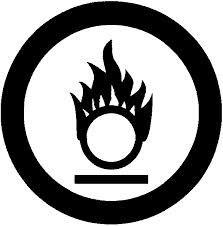 See below useful documents from the EPA on wells and septic tanks. There has been a dramatic increase in the number of cases of VTECreported to the Health Protection Surveillance Centre (HPSC) in 2012 (up 100%) which continued in 2013. Ireland has the highest incident rate of VTEC in Europe. Analysis of VTEC cases by the HPSC has found that patients are up to 4 times more likely to have consumed untreated water from private wells. 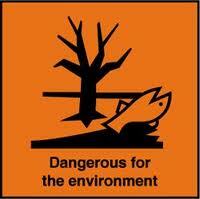 Also the EPA has reported that up to 30% of private wells in Ireland are contaminated (EPA, 2010). The Central Statistics Office states that approximately 170,000 domestic properties are supplied by private wells (www.cso.ie). Private water supplies, including private wells, are currently classified as “exempted supplies” under the European Union (Drinking Water) Regulations, 2014. This means that there is no requirement to monitor such supplies nor is there any regulatory supervision of such supplies. The lack of awareness by homeowners of the risks to private water supplies, as well as poor well construction and low levels of treatment provided, is currently a matter of concern for the Environmental Protection Agency. Well owners should check their wells to ensure their health is not at risk. This includes checking that there aren’t any sources of pollution entering their well and testing the well water at least once a year, ideally following heavy rain when it is most at risk of contamination. Disinfection kills all E. coli including VTEC and, while public water supplies are disinfected, most private wells are not. The EPA will be providing easy to use information on its website explaining what well owners should do to protect their health as well as a simple animation to explain the risks and web app Protect Your Well to assist well owners. Under the Department of Environment’s scheme, if your house is more than 7 years old and not connected to either a public or a group scheme, you may be eligible for a grant (subject to some conditions). The grant is worth up to €2,031.58 (or 75% of the cost of the work, whichever is the lesser) and must be used to provide a new water supply or to upgrade an existing one. Only one grant per house will be allowed in any 10-year period. In order to qualify for the grant, the proposed work must cost more than €635. A local authority inspection will be carried out before any work starts. VTEC are a particular group of the bacterium E. coli. VTEC infection often causes severe bloody diarrhoea and abdominal cramps although. In some persons, particularly children under 5 years of age and the elderly, the infection can also cause a complication called haemolytic uraemic syndrome (HUS), in which the red blood cells are destroyed and the kidneys fail. EPA (2010). Water quality in Ireland 2007-2009. Office of Environmental Assessment, EPA, Wexford, Ireland. The Water Framework Directive requires us to achieve a good status for all rivers by 2015. The country is divided into eight river basin districts (RBD). 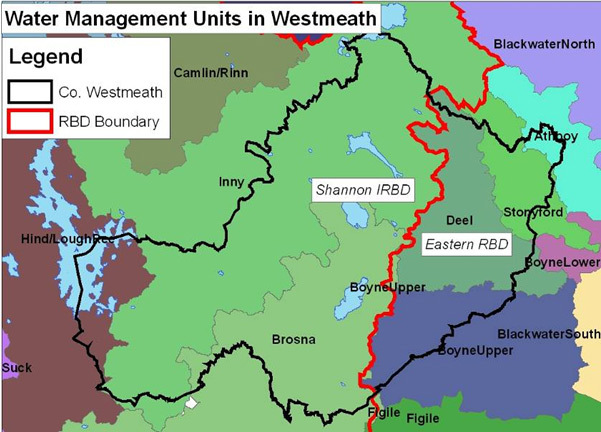 Westmeath County Council are in two River Basin Districts i.e, Eastern RBD and Shannon RBD. The Council participates in the management of these river basin districts by monitoring the quality of the water and implementing the programme of measures as set out in river basin management plans. These measures include identifying point and diffuse sources of pollution and enforcing existing legislation in order to eliminate them. Water is essential for all living things but when the quality of the water deteriorates then we have to do something about it. It was from the need to protect and improve water quality that the Water Framework Directive was derived and the publication of River Basin Management Plans. The Water Framework Directive (WFD) is a key initiative aimed at improving water quality. It applies to rivers, lakes, groundwater, and coastal waters. The Directive requires an integrated approach to managing water quality on a river basin basis; with the aim of maintaining and improving water quality. The Directive requires that management plans be prepared on a river basin basis and specifies a structured approach to developing those plans. It requires that a programme of measures for improving water quality be brought into effect by 2012 at the latest. River Basin Management Plans are to be prepared and renewed in six year cycles and the first plans cover the period to 2015. Each R.B.D has published a river Basin Management Plan. The River Basin plans set out the road map for the protection and improvement of our waters in the period to 2015 and beyond. They cover approximately 800 groundwater bodies and 5,000 surface water bodies (canals, rivers, lakes, transitional and coastal waters). the programme of measures to be implemented in order to achieve those objectives. They aim for significant improvements in water quality but they also recognise that in some cases soils and waters will take time to recover even where measures to address pollution have been put in place. The plans aim to improve the proportion of rivers and canals at good or high status from 54% currently to 68% by 2015, and the proportion of lakes at good or high status from 65% currently to 84% by 2015. The river basin plans are supplemented by Water Management Unit Action Plans which provide more detail on measures that are to be implemented at a local level. The responsibility for implementing the measures in the action plans rests primarily with the local authorities, various Government Departments and Agencies, and other sectors such as agriculture and industry. It is to this end that Westmeath County Council Environment Section shall be carrying our extensive environmental inspections in the Eastern River Basin catchment over the period April - August. The inspections shall cover the area of agriculture, septic tanks, commercial and industrial premises, illegal dumping and the extractive industry. The principle objective of the inspections shall be to protect and improve water quality through participation and co-operation of everyone within the catchment. In accordance with the Bathing Water Quality Regulations 2008 (SI no 79 of 2008) members of the public may nominate before 29th July 2014 an area that they consider should be assessed for suitability as a bathing water site. Submissions should be made in writing to Environment Dept., Westmeath County Council, County Buildings, Mullingar, Co. Westmeath. Environment Section staff carry out extensive environmental monitoring which includes water quality in rivers and lakes. Download Water Framework Directive for further information. 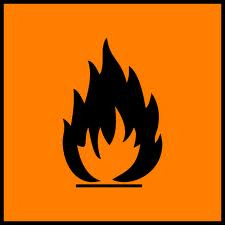 Health hazard properties: carcinogenic, mutagenic, toxic for reproduction, toxic, corrosive, irritant, infectious, harmful. The following are examples of common wastes that can be encountered on a farm. Those supplying you in some cases will also offer a take back scheme – check with your suppliers. See "Good Practice Guide for Empty Pesticide Containers below. 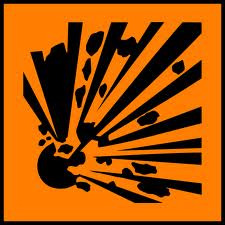 Hazardous waste may be collected by an Authorised waste collector or brought to an Authorised waste facility. Please contact the Environment Section on 044 93 32166 to ensure the collector/facility has a permit. Look for alternatives or products that are less damaging to the environment. Use products such as chemicals before they go out of date. Only purchase the amounts needed. Store and dispose of hazardous waste through a licenced waste contractor. 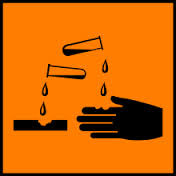 Triple Rinsing of chemical containers may not necessarily render them non hazardous or suitable for recycling. The effectiveness of the rinsing depends on whether or not the chemical has infiltrated the fabric of the container, and this depends on the type of chemical, how long the container has been stored and under what conditions. Your supplier/manufacturer should be able to advise you on whether the chemical is likely to have infiltrated the fabric of the container. You should contact your supplier/manufacturer in advance to establish this information before embarking on any triple rinsing procedure. Empty the pesticide into the sprayer tank and let the container drain for 30 seconds. Fill the container 10 percent to 20 percent full of water or rinse solution. Swirl the container to rinse all inside surfaces. Add the rinsate to the spray tank and let drain for 30 seconds. Inspect the container to be sure it is clean. Chemical may remain in the corners, the handle and container threads. This must be removed. Also, be sure drips on the outside of containers are cleaned off. Put the cover back on the container and dispose of according to label directions. If containers are to be recycled, leave the cover off and store in a dry, secure area. It is the responsibility of every farmer to ensure that they do not present contaminated containers for recycling.